This is probably going to be the shortest post I’ll write. Ugandan bloggers dedicated the last week to writing about a special means or mode of transportation that is so popular in Uganda. The use of Boda Bodas – motorcycles. They are quick and very effective if you’re in a rush. But as that may be, they can be so fatal especially if a few factors are not held constant. 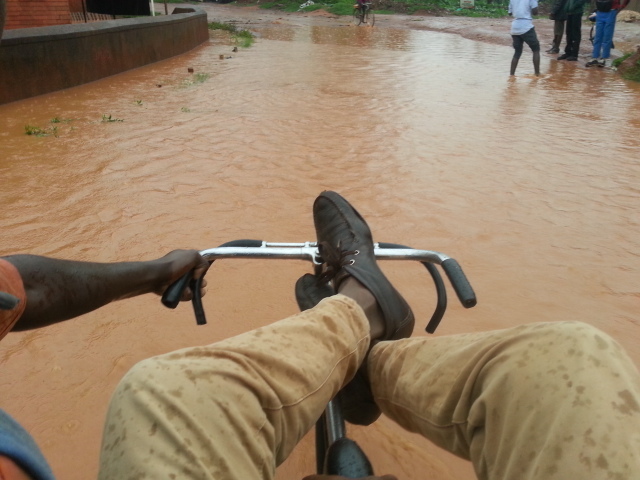 To my dismay, no body wrote about my favorite Boda service. Boda – gaali (Boda bicycle). In certain scenarios, like the one in the image above, a motor cycle will probably not be of much help. Also, if we were to consider the current drainage situation in this city, we need all the help we can get. Don’t we? This post is only a badge and vote of appreciation to Ugandans who go out of their way to make sure we don’t walk through our ugly mistakes. So we can get to our offices clean and pretend the world is at peace. On this note, I send all my love to all our politicians. Thank you for the work well done. Mwe abasinga.